Congratulations to Melven and Ivirne Allen, members of GCI’s congregation in Big Sandy, TX. October 9 was the couple’s 60th wedding anniversary! Melven was a long-time Ambassador College (Big Sandy) employee and the couple served on staff for many years at SEP (GCI’s youth camp) in Orr, MN. The Big Sandy congregation hosted a celebration for the Allens on October 7. Over 100 family and friends attended a luncheon following the worship service. The fellowship hall was beautifully decorated, including the display of hundreds of pictures of the Allens and their family. 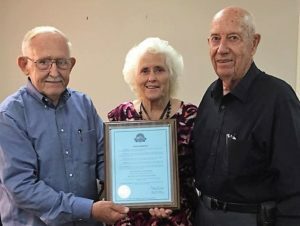 As shown in the picture at right, Big Sandy Mayor (and retired GCI Pastor) Sonny Parsons presented the Allens with a framed proclamation from the city congratulating them and proclaiming October 9, 2018 as “Melven and Ivirne Allen Day” in Big Sandy. A fantastic achievement. Chapeau! It must have been a tremendous occasion. Ivirne and Melven, your example of a relationship of love over a very extensive time is inspiring. May God’s blessings continue to flow to you and from you.